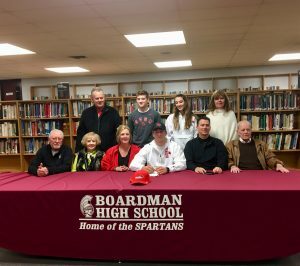 Congratulations to senior football player Michael O’Horo as he signed his National Letter of Intent to continue his academic and athletic career at Saginaw Valley State University in Michigan. Michael was a three year starter for the Spartans at quarterback and was voted a team captain his senior year. In his senior year, he earned All AAC 1st Team Honors, Big 22 Award winner, and Honorable Mention All Inland District Northeast. He also set new school records his senior year and became the All-Time school leader in completions (289) and yards (3,464). In Michael’s junior year, he received All-AAC 1st Team honors, Big 22 Award winner, and 2nd Team All Inland District Northeast honors. Michael is the son of Patrick and Nicole O’Horo. He also received offers from Notre Dame College in Ohio, Ohio Dominican, Tiffin, and Urbana. He received preferred walk-on offers from Ohio State, Akron, and Bowling Green.